In August 1872, the Shojakukan library opened in the grand hall of the former Yushima Seido. The museum, still in its early days, planned to build the Shojakukan to form a part of a comprehensive museum that incorporated a zoo and botanical garden. 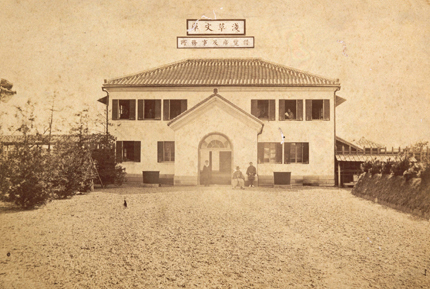 In 1869, the government merged such education facilities as Kaisei-jo, Shoheizaka Gakumon-jo and Igakukan created by the Tokugawa shogunate to establish an academy. At the same time, it took over the books of the former shogunate kept at the Momijiyama Bunko library and other book repositories. The books from Momijiyama Bunko were sent to the Dajokan, the country's top ministry; those from the Shoheizaka Gakumon-jo went to the newly established academy; books from Igakukan went to Daigaku Toko, predecessor of the University of Tokyo; and books from the Bansho Shirabesho were transferred to Daigaku Nanko, also a predecessor of the University of Tokyo. The Ministry of Education opened the Shojakukan to coincide with the opening of the Museum, with the aim of gathering together the books that had been handed over to different ministries and making them accessible to the public. This marks the beginning of the modern library in Japan. When it first opened, the Shojakukan was housed in a building that was 18 meters east to west and 14.4 meters north to south, and a reading room was set up on the second floor. It is said to have contained a collection of more than 130,000 books that embraced 13,000 titles. On August 1, the opening day, a newspaper reported that "users came to see the books from this very first day," showing that the public had great interest in the facility. In 1874, the government decided to move the Shojakukan to the No. 8 rice storehouse in Kuramae, Asakusa so that the great hall of Yushima Seido could be used as a conference hall by the local bureaucrats. Consequently, the Shojakukan changed its name to Asakusa Bunko and construction began on a building that incorporated two book depositories, a reading space, and an office. It was completed in the following year, and so began the Asakusa Bunko library. It was open daily, except for the year end and New Year, from 8 a.m. until 4 p.m. At its peak, the facility attracted 8,056 users a year (4,071 for public use, 3,985 for private use). In addition to the collection of approximately 140,000 classics, the library kept antique calligraphic works and paintings, and allowed the visitors to study them and reproduce them. In 1881, Asakusa Bunko was moved to the book department within the Museum that was newly built in Ueno Park. The opening of the Shojakukan and Asakusa Bunko were pivotal events in the cultural and educational history of Japan in the early Meiji period. Although some of the books at the Shojakukan and Asakusa Bunko were returned to the Home Ministry, most have been preserved to the present day and they form the basis of the Museum library.